Disney, Lions Gate, and Discovery stocks have gotten cheaper. Here's where that creates opportunity for investors. Investors looking for exposure to the cable content industry are in luck: Many such stocks have underperformed broader market averages over the last year, leading to some unusually cheap valuations. The challenge is to separate the good investments from the ones that have taken serious hits to their business models from shifting consumer behavior. With that in mind, let's take a closer look at three cable stocks: Lions Gate (NYSE:LGF-A), Disney (NYSE:DIS), and Discovery Communications (NASDAQ:DISCK). They have all gotten cheaper lately, but do any of them look like good buys right now? The House of Mouse has produced mixed results lately. On one hand, its media business is struggling as subscribers peel off of cable packages and step away from costly options like ESPN. Media networks account for about half of Disney's profits, and operating income is up only 3% in that segment over the last nine months compared to a 10% jump in the prior full fiscal year. That slowdown helps explain why the entertainment giant is currently the second worst performer in the Dow over the past 12 months. However, a Disney investment is about much more than just network TV. The company is closing in on its best box office performance in over a decade, it just made a huge push into the Chinese market opening its biggest theme park yet, and a lucrative streaming deal with Netflix will begin paying dividends this quarter. Given the many ways in which Disney can produce higher earnings as the traditional TV business evolves, I believe the stock is even more attractive now that its forward P/E ratio has dropped to 16 -- a low it has only touched a few times over the last decade. Lions Gate, the content specialist that owns popular movie franchises like Hunger Games and hit TV shows like Orange is the New Black, has seen its stock crater as its earnings power sank this year. Net income for the 12 months ended this March was $50 million, compared to nearly $200 million in fiscal 2015 and $152 million in the prior year. Executives blamed a poor showing at the box office for the sharp decline. LGF Net Income (TTM) data by YCharts. The company has a stronger film portfolio in place this year, and its TV business is also ramping up nicely. But the fate of its business is now dependent on the long-run outcome of its expensive $4 billion merger with Starz (NASDAQ:STRZA), which has struggled with its own lackluster results lately. The combined company will be a true content powerhouse with properties that span the TV, movie, and streaming businesses. However, a buyout of this size is likely to produce major integration challenges in the coming years. Considering that the two businesses weren't generating strong results on their own, it's risky to bet on the combined entity faring a lot better. 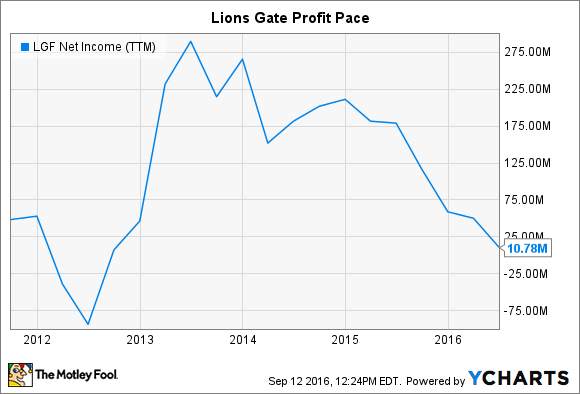 That makes Lions Gate's stock price drop seem justified -- at least until investors have a better view on how the new company will operate. Discovery's business is holding up well as consumers step away from the legacy broadcast TV setup. The company posted its second straight quarter of accelerating growth in advertising revenue in Q2 and earnings per share surged higher by 50%. Look beyond the headline numbers, though, and it's clear that this company faces major long-run challenges. Advertising volume sank last quarter despite solid ratings, which is a trend that's likely to continue due to the shrinking pool of cable TV subscribers. The good news is that growth in markets outside of the U.S. made up for most of that decline. Discovery's management is making aggressive cost cuts right now that include layoffs and restructuring moves aimed at addressing what CEO David Zazlav called "shifting consumer behavior" in the media industry. These savings, plus a highly profitable U.S. segment, will buy time for the company to build up its international division while testing out new ways to monetize content outside of the traditional pay-TV ecosystem. Investors with a long time horizon might find that an attractive investment idea given that Discovery shares are at four-year lows. Disruption in the media world is upending business models that had been generating increasing profits for decades. While that shift raises the risk for investors entering this space, it also provides opportunities as valuation levels drop to unusually low levels.